So You Want To Learn About the Civil War? Slavery caused the war, but the war was not begun to free slaves. The war had begun to determine whether the Confederate States of America would be allowed to break away as an independent nation, or whether the existing Union would survive. Only later did the the conflict become one of liberation. Why did the South want independence? Southern wealth was mostly invested in slaves or slave-worked land. Abraham Lincoln, newly elected president, led a party pledged to ban slavery in new states. Throughout the war, both sides sought a single decisive victory long after it was clear that no such event was achievable…. Although Grant was called a butcher, Confederate losses, relative to the size of their army, were greater. A few southern soldiers and civilians suggested as early as January 1864 that the Confederacy enlist slaves as soldiers, but most white southerners disagreed. One Confederate politician noted that, “if slaves will make good soldiers [then] our whole theory is wrong.” Desperate to avert defeat, the Confederacy authorized the enlistment of slaves on March 13, 1865, far too late to affect the outcome of the war. In 1861, pro-Union supporters defended the nation that had been created in 1776. Pro-Confederates said they were exercising the right, enshrined in the Declaration of Independence, to “alter or abolish” unrepresentative and oppressive government. Wherever a Virginian placed his or her loyalty–to the rebel nation of 1776 of the new rebel nation of 1861–he or she was a patriot to the eyes of some and a traitor to others. Slaves and free blacks provided more labor than usual for Virginia farms when 89 percent of eligible white men served in Confederate armies. Enslaved men were sometimes forced into service to build fortifications, women to serve as laundresses and cooks for troops in the field. Fearful that they might lose their freedom if they failed to contribute to the war effort, free blacks often worked beside the slaves, for minimal wages. Freedom as Confederate independence failed. Defeat threatened to change white southern identity that had been based on racial supremacy. Although black Virginians were no longer enslaved, equality remained an unfulfilled goal for generations to come. I was looking into contacting the VHS for a little interview for my thesis and stumbled accross the contact information for “de Witt, Ann C.”, Manager of Web and Digital Resources. Is this the same Ann de Witt who has worked on the black confedrate soldier? If so, what do you think of her involvement and her role in particular? I notice in your recent webcast on Black Confederate soldiers you cover Ann’s website. My apologies if it is not in fact the same person. Oh I see.. Shame – it would have been an interesting angle. That’s right. There is also going to be a traveling exhibit on a flatbed truck, which sounds quite promising as well. 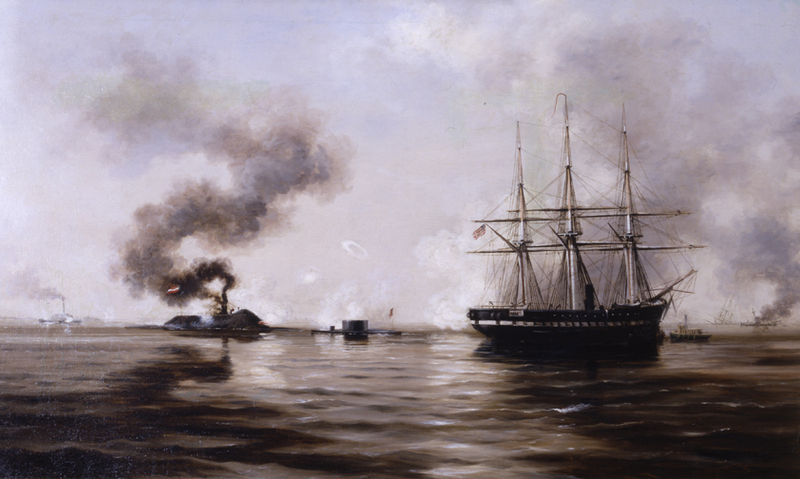 The illustration here is a bit outside the usual topics discussed here, but I think it illustrates a minor curiosity of Civil War memory; many writers seem to fail to notice the significance of the fact that the Monitor was unable to sink the Virginia. Also, the Monitor class was specifically designed for coastal and river work, and wasn’t very seaworthy. A monitor in the open sea would have been easy meat for a conventional ironclad with an underwater ram and a fair turn of speed. Even Macpherson, I believe, wrote something like “the Monitor immediately made every other warship in the world obsolete”. Why are historians so impressed by the novelty of the thing that they don’t look at its effectiveness?